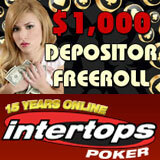 Intertops Poker tables at every level, from novice to expert, are going to be extra busy this month. May’s $2000 Reload Bonus and $1000 Free Roll Tournament and the continuation of the Frequent Player Points Race will attract more players than usual to the popular poker room. Until May 26th, Intertops Poker’s Reload Bonus will automatically double players’ deposits (up to $2000). A special free roll poker tournament at the end of the month will give players a chance to win big money while risking nothing. Every player who makes a minimum $20 deposit between now and May 26th using the reload code sent by email will receive a ticket to play in the $1000 Free Roll on May 29th. This is a free poker tournament with a guaranteed $1000 prize pool. There are also several freeroll tournaments every day where players can get their bankroll started with no risk at all. Also this month, the Frequent Player Point Race continues with 40 players splitting $2500 in cash prizes at the end of the month. This month, daily and weekly prizes will also be awarded to the top five leaderboard champions during that period. 40 players at the top of the Easter Frequent Player Point Race leaderboard have just received their share of last month’s $2500 FPP prize pool with a player known as ZOARTER pocketing $410. After fifteen years of excellent service, players trust Intertops to offer the best bonuses and promotions and to make their withdrawals quick and easy. Intertops took the very first online wager more than a decade ago and is still one of the most responsible and trusted casinos, sports books and poker rooms in the world.